Now in our 14th year of this super successful London club night that started back in 2001 bringing together all the different elements of the London 60s scene for a big night of pure vintage underground partying. This 1000 capacity venue in the heart of Central London home to Le Beat Bespoké, Nutty New Year and New Untouchables live promotions has three rooms of action with an all night bar! 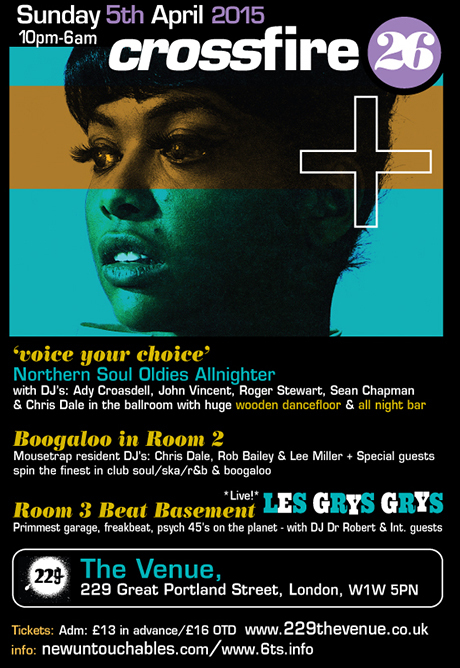 NORTHERN SOUL music has reached a whole new audience through the film called Northern Soul, now you can experience the real deal in our fabulous ballroom with huge wooden dance floor to a soundtrack of the best Northern Soul oldies from historic venues of the past. Hosted by Kent Records and 6TS promoter and DJ Ady Croasdell with special guest deejays from around the UK. The BEAT BASEMENT is hosted by the extraordinarily successful Mousetrap all-nighters in Finsbury Park. Resident DJ Dr Robert (Le Beat Bespoke) and guests from around Europe spin the primest 60’s Beat, Garage, Psych committed to vinyl. Expect maximum fun, gorgeous go-go girls to a backdrop of kaleidoscopic visuals. The R&B ROOM is hosted by London promoters the New Untouchables with authentic Rhythm and Blues, Ska/Reggae and Club Soul on the menu from resident DJ Rob Bailey and special guests from around the top European R&B club joints. We want to invite you to be part of our 6Ts rhythm and Soul Society. Be informed, be involved, pass it on, keep the faith! In 2008 Colin O'Toole directed this documentary for Channel 4s ‘3 Minute Wonder’. Recognise our star? © Copyright 2013 6Ts rhythm & Soul Society All rights reserved.